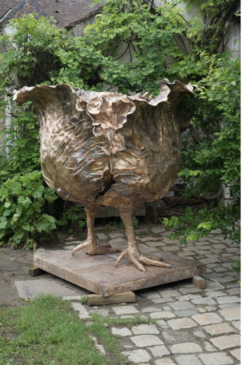 The Galerie Mitterrand is hosting the first solo show of Claude Lalanne followed by a separate exhibition of Francois-Xavier Lalanne’s work from June 1 – July 28th. The idea behind the two exhibitions is to focus on each of the artists individuality. The relationship between Les Lalannes and Jean-Gabriel Mitterrand goes back to the creation of the gallery 30 years ago in 1988. Claude Lalanne is one of the few world-renowned female French artists alive today. 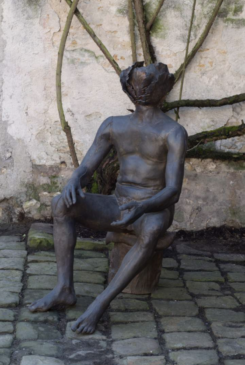 Claude Lalanne’s pieces are mainly created by making molds, casting and electroplating. She discovered this method through the American artist James Metcalf in 1956. Claude Lalanne uses natural forms and instinctively turns them into sculptures, tables, benches or mirrors. 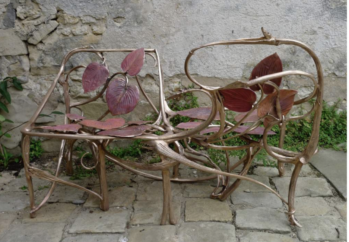 “What matters is the shape and what it conveys to me.” says Claude Lalanne. The exhibition showcases her artistic work from the 1960’s to the present through 40 pieces. One seldom scene series of body molds were created in 1975 which echo an order made by Yves Saint-Laurent for his autumn-winter collection of 1969. The sculpture Man with Cabbage Head from 1968 was made famous by Serge Gainsbourg’s album and is featured alongside the artist’s copper-plated Choupatte (Cabbage with legs). Claude Lalanne was born in Paris in 1925 and lives and works near Fontainebleau.